Your struggling career as a journalist is salvaged when the world's first sapient robot Turing (Melissa Hutchison), recruits you to investigate their creator's kidnapping. Together, you'll encounter colorful locals and maneuver through difficult situations as you delve deeper into the secrets of Neo-San Francisco. How far will you go to expose the dark truths behind the overlapping future of technology and humanity? Can you survive in Neo-SF? Of will the mystery go unsolved? • 10+ Hours of classic point and click adventure gameplay! • A cinematic experience with a robust voice cast! • Determine the fate of Neo-SF through multiple endings! 02-26-2018 price5474 Box Text Neo-San Francisco, 2064 A.D. Your struggling career as a journalist is salvaged when the world's first sapient robot Turing (Melissa Hutchison), recruits you to investigate their creator's kidnapping. Together, you'll encounter colorful locals and maneuver through difficult situations as you delve deeper into the secrets of Neo-San Francisco. How far will you go to expose the dark truths behind the overlapping future of technology and humanity? Can you survive in Neo-SF? Of will the mystery go unsolved? • 10+ Hours of classic point and click adventure gameplay! • A cinematic experience with a robust voice cast! 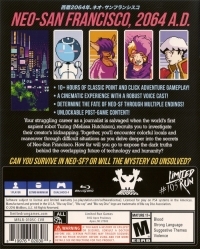 • Determine the fate of Neo-SF through multiple endings! • Unlockable post-game content! 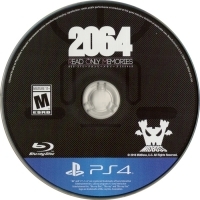 This is a list of VGCollect users who have 2064: Read Only Memories (Alternate Cover 1) in their Collection. 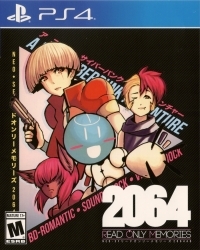 This is a list of VGCollect users who have 2064: Read Only Memories (Alternate Cover 1) in their Sell List. This is a list of VGCollect users who have 2064: Read Only Memories (Alternate Cover 1) in their Wish List.